Geneva Hair Studio is so popular for bridal services that they have set packages to accommodate for such formal looks. You can come to this company and know that you will have a relaxing and enjoyable experience as you and your best friends prepare for the walk down the aisle. You can even get ready in the studio with your group and have the wedding hair and makeup of your dreams. You will even be able to work with this team of artists to make sure that your entire party has a consistent style throughout. 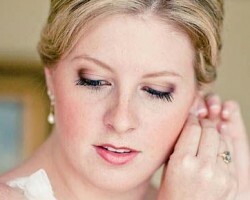 Danielle Wilson is a makeup artist in Indiana that has focused her skills and talents on bridal makeup. With that, Danielle tries to be as accommodating as possible for her clients. This means that for great prices, she will come to your venue and help you het ready in a setting where you can relax. She will use the latest and most effective techniques to make sure you look picture perfect for your walk down the aisle and feel comfortable with the style and the colors that she uses. When you want to look amazing for your wedding day without stressing about applying the look yourself, La Dolce Salon & Spa is there for you. This boutique offers event and airbrush makeup from the experts that have studied and executed their craft for years. The goal of these Indianapolis makeup artists is to make you feel your best whenever they are hired. All of your best features will be accented in a way that suits your personal style and the style of the occasion. Rachel, the owner of Beauty Anywhere, has a passion for makeup and for making her clients look and feel beautiful. This is why she is one of the most highly sought after artists for weddings. Not only will she enhance your natural beauty but she will really pay attention to your personal style, the colors you like and the style of the occasion. She will use techniques that will make the look last for the entire celebration and feel like permanent makeup. These, and a great personality, are all things that reviews of this service rave about. Daniel Klingler is the owner and operator of Neck Up Design. As a professional makeup artist in Indianapolis, IN, this expert has experience with theatrical makeup as well as in-salon and special event makeup application. For affordable rates, you will be able to hire this artist to provide his flawless styling work for your big day or any special occasion that you may have. He will be able to listen to the style that you would like and then create a flawless look that you will love and feel comfortable with.